Assistant Coach Denzel Mabry works with students at Westlake (photo by Leonardo Flores). Westlake Middle School in Oakland is the first program of the new Beat the Streets Bay Area. Tuesday March 12th was the first practice and the group of wrestlers at the school is small but mighty. Westlake has been open, friendly, and extremely supportive of our programs with Mr. Moses, Coach Mom, and Mr. San-Chez presenting a face to the school that is beyond admirable. Personally, I have been teaching for 10 years, and I have been in school culture trainings on campus culture consistently throughout my career. Westlake Middle School has a tremendous campus culture created by a caring staff and strong leadership. That doesn’t mean that the school doesn’t face a great deal of hardship. Part of the Oakland educational landscape, and the gentrification that impacts it, has left Westlake under enrolled. The school has had over 95% of their students qualifying for free or reduced-price meals since the 2014-2015 school year (via EdData). Access to athletics in our current pay-to-play society has been severely impacted in low income communities and this program has a huge amount of potential to help engage students in school through sport. Some of the Westlake wrestlers warming up to start practice (photo by Leonardo Flores). BTS Bay Area has been able to provide a mat, shoes, kneepads, headgear, and coaching to get the program at Westlake started. Coaches Allen Loretz and Denzel Mabry have provided an environment for Westlake students to experience something new and learn technical fundamentals of wrestling, physical literacy, and provide a place for character development. Wrestling is a unique sport, and we are honored to help increase wrestling opportunities in Oakland. 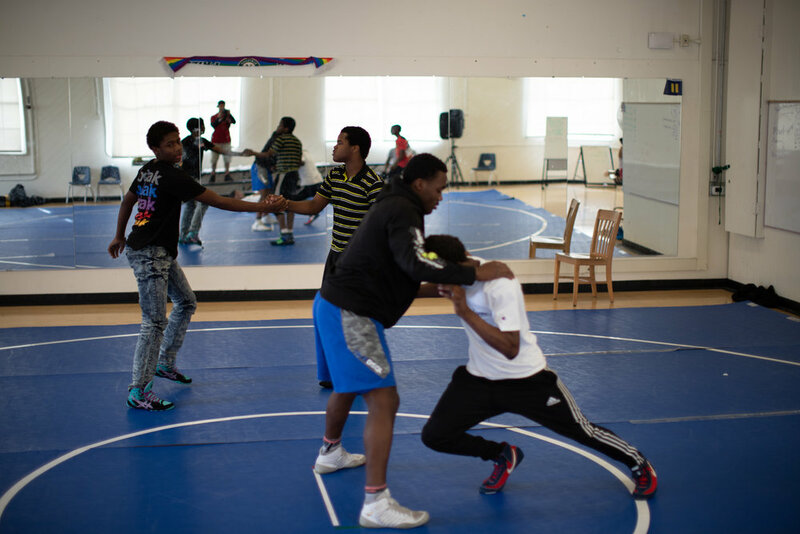 One of the Westlake wrestlers has already attended the Wan Tu Wazuri club in Oakland, which is the longest standing wrestling club in the city under Coach Ashley Sherman. From left to right: Head Coach Allen Loretz, Director Daniel McCune, and Assistant Coach Denzel Mabry (photo by Leonardo Flores). We will continue down this path, finding partners, creating impact, and lifelong relationships with adults and students alike as we provide opportunities for growth, mentorship, and improvement through wrestling.